When a tree falls, the stump remains which can cause a hazard depending on where it is. Removing tree stumps also lessen the likelihood of harmful fungi spreading. There is a special device for this purpose – a Stump Grinder. The stump grinder eats through the tree stump shredding it into mulch or sawdust. It is built with a blade that rotates and shreds the tree stump to mulch or sawdust. Some are designed so that the user can control the depth and penetration, while others are designed to self propel into the stump until there is nothing left to chew through. A stump grinder uses hydraulics to make the movement of the cutting wheel through the wood manageable. To position the cutting wheel, the user has to move the hydraulic lever in order to lift the cutting wheel. When the wheel starts spinning rapidly, the user should lower the cutting wheel into the stump a few inches and then move it back and forth using the hydraulic lever. The wheel will move through the wood and shreds it to saw dust until the stump has reached the ground. During the process the entire core of the tree is removed. 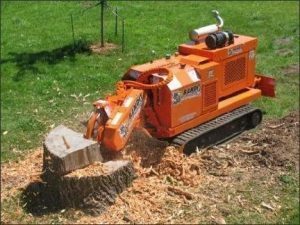 When the stump has been grinded to ground level, the user should now lift the stump grinder and reposition it on the piece of stump that is left on the ground to completely grind away the remaining piece. A hole will be left in the ground approximately 4 to 12 inches deep. The tree will never grow again. The hole can be filled with soil or the chips from the stump. Bandit Stump Grinders are reliable and innovative. There is a model to suit the many different needs that a stump grinder is used to fill. There are small versions like the Sidewinder handle bar model to large, heavy duty types like the high-production 600 horsepower model. All the stump grinders made by Bandit are built with durable all-steel making them extremely durable. With a Bandit stump grinder, production will be enhanced. 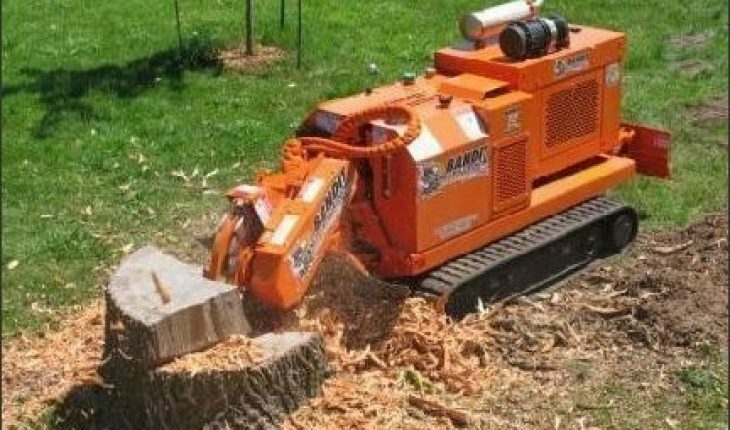 Hawk Stump Grinders are designed to tackle tough tree stumps safely. They are designed so that the user is positioned away from the grinding area. They feature low maintenance costs while delivering high performance. Vermeer stump grinders take the back-breaking, labor intensive work out of removing tree stumps. They are tough, reliable and easy to operate. Use a Vermeer stump grinder and watch while the stump is quickly swept away. Other popular brands are Rayco and Carlton. Stump grinders are available for rental or purchase. Since it is a type of equipment that is not used frequently, most people rent them. When selecting a stump grinder, consider the size of the stump to be removed. A big stump will require the use of a big stump grinder. Stump grinders are available at hardware or home depots or online. Some of the places that sell them also rent them.